Inside the advance third quarter GDP report, the details in most of the important categories suggested slowing after two quarters consistent with “reflation” at least in its third try. If the economy swings between shallow downturns and often shallower upturns, these subcategories give us some insight as to why. Overall, growth remains at a level that is not growth, whether consumers or business investment. 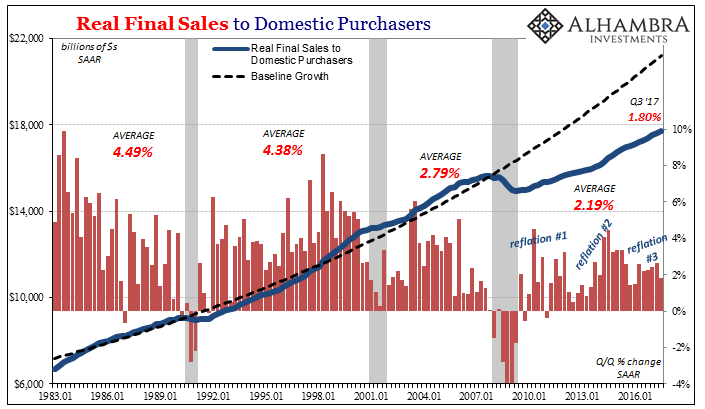 Real Final Sales to Domestic Purchasers, a measure of US demand regardless of where the goods/services originated, increased by just 1.80% (Q/Q SAAR) in Q3. That was the lowest rate of expansion since Q1 2016 and the near-recession trough. 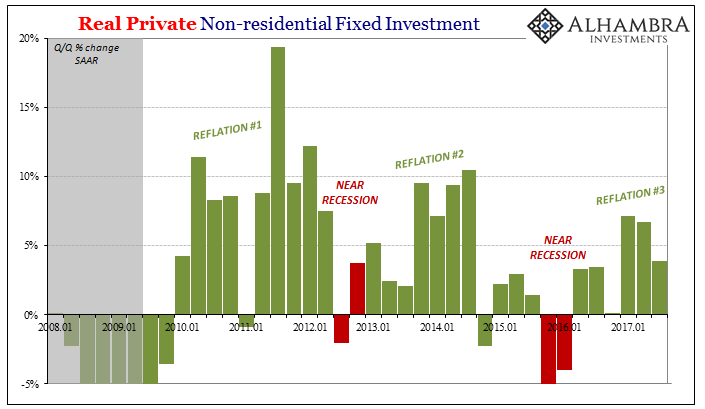 It doesn’t bode well for future growth both as a reflection of incomes and the labor market but also the slight uptick in inventory detected by GDP also in the third quarter. That’s a potential problem for domestic producers as well as those overseas (China). 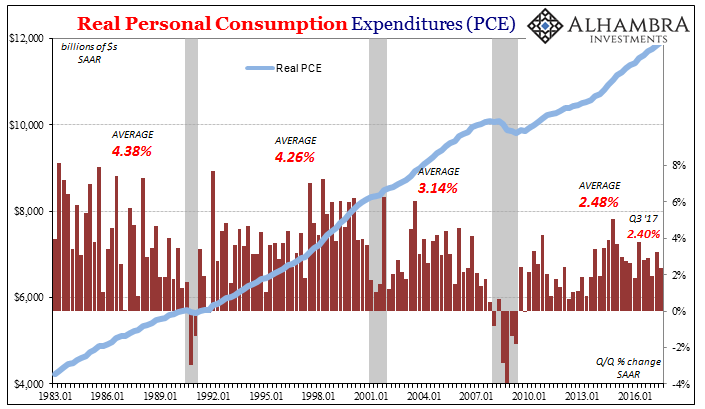 In terms of consumers alone, Real PCE growth remains stuck around and less than 2.5%. That’s substantially less than consumer spending growth that propelled actual economic advancement in the latter 20th century (with the eurodollar-fueled debt of the 2000’s serving as the initial transition to what we have now). In the media this is classified as “strong” and “resilient” when in fact it shows just how much trouble American workers have as compared to prior periods. Most concerning of all is business investment. 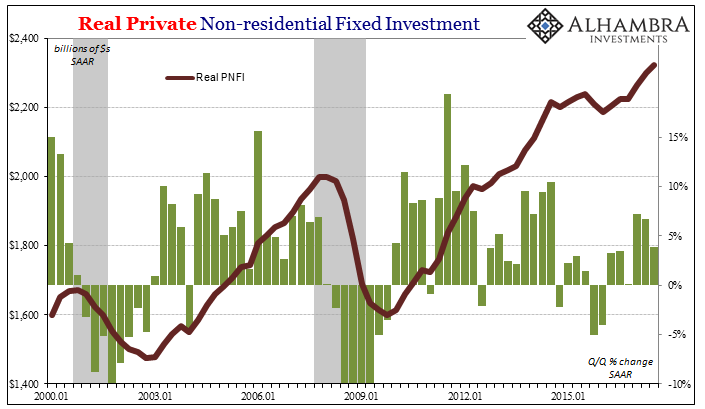 Real Private Non-residential Fixed Investment (PNFI) is a measure of capex, perhaps the broadest for the overall US economy. Quarter-over-quarter, PNFI rose by just 3.9% (SAAR) in Q3, a notable slowing from Q1 and Q2. Neither of those prior two quarters was all that solid to being with. 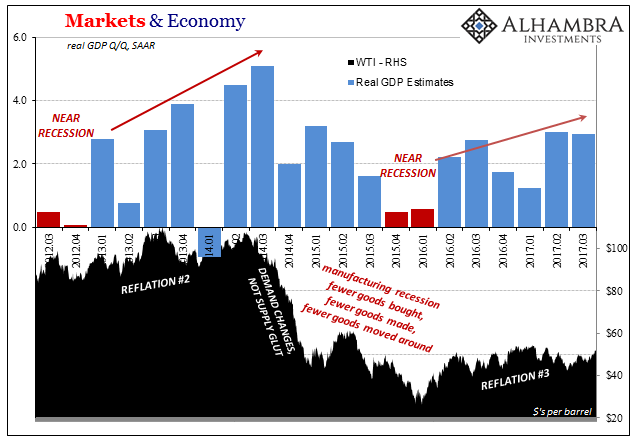 It is here where the so-called supply side or economic potential originates, and it is here where these upturn/downturn cycles are most evident – and therefore disquieting. After massive cuts to capex due to liquidity constraints first during the worst of the Great “Recession” and its immediate aftermath, capital project spending didn’t really recover by a rate or level commensurate with that contraction. That was in all likelihood due to liquidity concerns especially at the corporate level. Worse, after both subsequent monetary events (2011-12, 2014-16) aggregate capex becomes weaker for each one. Given what we know of corporate usage in the bond market (heavy), it seems out of character to tie it to liquidity preferences except in view of how those proceeds are actually being used (more and more financial “investment” rather than productive expansion). From the perspective inside the boardroom, an economy that isn’t actually growing (confirmed by these downturns) is a greater risk than stock prices that appear invulnerable. Risk perceptions matter a great deal where economic opportunity is so limited. 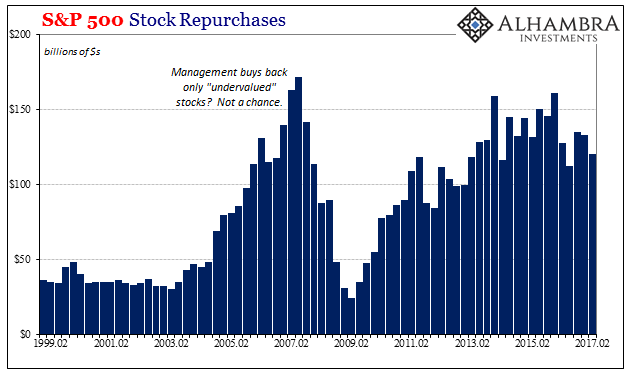 In other words, the worse the economy performs the more shares corporates will repurchase considering that to be the least risky use of scarce funds (in light of revenue and profit growth, or the related lack thereof). 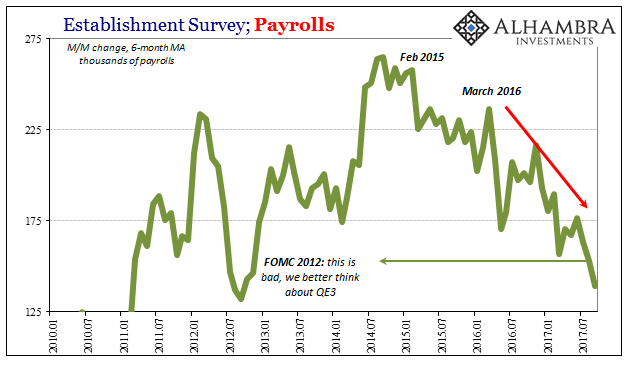 What saved the day, so to speak, for the GDP headline was nothing more than inventory. Without it, Real GDP grew by 2.21% in Q3, down from 2.89% in Q2 and more like the deceleration we find internally. Unless something happens during the current quarter to turn this around, businesses may find that inventory more of a hindrance and therefore an economic drag rather than a boost. Perhaps the effects of Harvey and Irma will provide some reprieve, but that shouldn’t last long with insurance premiums (among other things) already being re-evaluated for billing early next year. It’s another really clear demonstration of this ratchet effect, where the intermittent monetary or liquidity (“dollars”) interruptions leave the US economy worse off for every one. We still haven’t recovered from 2008, let alone 2015-16, but each time it gets harder to overcome the downturn immediately before while still at the same time trying to grow our way out of what is now a complete lost decade. Unless something radically changes, Q4 2017 kicks off a second one no matter how many times over the next three months you see 3% celebrated (and it will be) as if it means something.